Scalded Flea ...: So Sore! They say that day 2 of muscle stiffness is worse than day 1. I am saddened to report that this is in fact dead on balls accurate. I am doing okay if I am moving. The first few steps are a little Frankenlike, but then I am okay. Trouble is when I STOP or sit down for awhile. Then I get all stiff/sore again. Boys had a really great time at the cabin with Owen and Brad. Completely enjoyed themselves and then knowing that they didn't have to go to school today and instead just get to hang out with their friends and play all day? Well that is just icing on the cake at this point. Logan is pumped because the "kinders" get to visit the Before and After School program this week as they will be moving up next year. On a side note, the groupings of the kids, named by the kids, cracks me up. We have the "nappers", "kinders" and the "BA". Sounds like gangs from the book "The Outsiders"; "Greasers" versus the "Soks". Man.. that was a good book. Out of many of the craptastic books that I read in junior high/high school - gotta admit that was one of my favs. Plus, they turned it into such a good movie with a boatload of hot actors (which never hurts)...Matt Dillon...Patrick Swaze...Rob Lowe...Emilio Estevez...Tom Cruise. Yeesh, but looking at the pics of Tom Cruise, he has gooten much better with age. The other books I read in high school didn't leave much of an impression. I remember Ulysses...never really got into it. 1. One Day in the life of Ivan Denisovich - a story about a single day of life of a prisoner in a soviet war camp. 2. 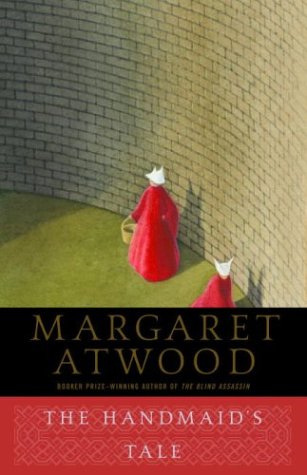 The Handmaids Tale - I give high school credit for exposing me to the brilliance that is Margaret Atwood. There were loads of other of course, but honestly, I can't remember them all. I do recall not hating Gulliver's Travels, but then I also remember my pervy English teacher talking about the sexual connotations of the Brobdingnagian people. Ew. If that doesn't turn you off novels to have a portly man with ear hair going into specifc details, not sure what will. I didn't mind Great Expectations, but I found Tess of the D'ubervilles completely painful. There are some books that I want to love, but just cannot get into them. Emma by Jane Austen is like that. Love the plot line, enjoyed the movie, but the book I just cannot read. Every page is like taking a sleeping pill. One of those things I guess. Tess is one of my all time favourite books. I have read it a few times. I think Thomas Hardy is my favourite author. I do agree with you about Emma, I didn't enjoy it.